When was the last time you actually physically dialed a phone number on your cell phone instead of just scrolling through your contact list to call a friend or business colleague? If your phone sustained water damage or you misplaced it, how would you access your stored contact information? Luckily Verizon Wireless offers its subscribers a free online contact backup tool, so you can rest easy knowing that you can access your contact information, even if you accidentally run over your wireless device. The Verizon Backup Assistant functions with most cell phones supported by Verizon, including newer Android and BlackBerry models. However, the online backup tool does not work with the iPhone 4, Motorola Devour, BlackBerry 8830, BlackBerry Pearl 8130, or devices that have Palm or Windows Mobile operating systems. To check to see if your feature phone has the ability to use the online backup service, access the Verizon application store on your wireless device and look for the “Backup Assistant" download. Compatible Android wireless devices should have a “Backup Assistant" icon on the home screen, or the icon may appear under the contact screen. 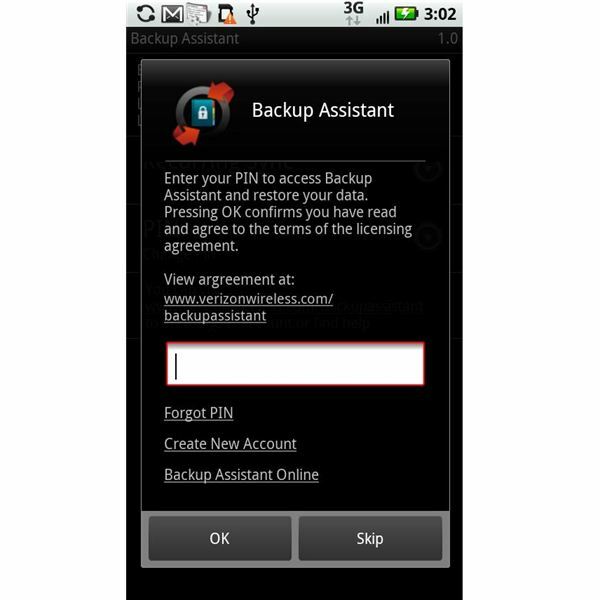 For BlackBerry devices, access the menu screen and look for the “Backup Assistant" icon. Once you’ve located the “Backup Assistant" on your feature phone or Android device, select the icon to begin downloading the application. You will need to create a security PIN containing either four or eight digits, and the application may prompt you to choose a specific time during the day when Verizon will automatically perform backup operations. Android users also need to agree to the application’s terms before completing the installation process. If you have a BlackBerry, select the “Backup Assistant" icon to initiate the download process. The application may ask you to allow it to access information on your device before installing successfully. BlackBerry users must agree to the application’s terms before the application will function. To initiate a manual backup of contact information, select the “Backup Assistant" icon and choose the option to “Backup Now". If you weren’t prompted to select an automatic backup time during the installation process, you may set up recurring daily backups by selecting “Options" and choosing either the “Schedule" or “Recurring Sync" setting after opening the “Backup Assistant" icon. The Verizon Backup Assistant requires you to assign a name to each of your contacts. You must associate each of your contacts with either a phone number or a properly formatted email address. If any of the contacts in your address book do not have these pieces of information, the online backup tool won’t save any information linked to that contact entry. In order to use the Verizon Backup Assistant, you need to either register your phone number on the My Verizon website, or just sign in if you already have a user name and password. After signing in to the Verizon Backup Assistant, you can access different contact management features. If you’ve misspelled a contact’s name, or you need to update a wireless number, use the online backup tool to make changes or add information to existing contacts. The online backup tool allows you to import and export contact information. After you’ve completed any contact changes, you can update the contact list on your wireless device while you’re still logged into the Verizon Backup Assistant. If you purchase a new wireless device, you can sync your new device with the online backup tool, allowing you to quickly transfer contact information to your new phone. If you have a picture of a friend stored on your computer, upload the image to create a profile photo. The image will appear with the person’s contact information on your phone. 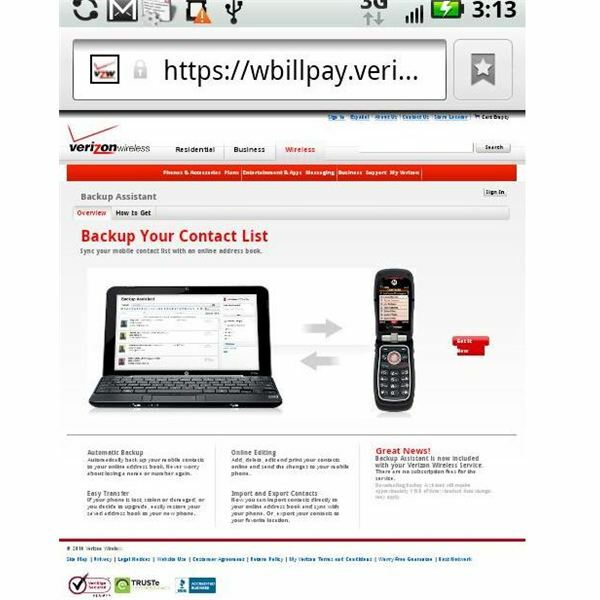 If you need a paper copy of your contact information, use the Verizon Backup Assistant to print out your address book. To restore your address book to a new wireless phone, sync your device with the Verizon Backup Assistant. When restoring contact information, you may lose certain custom settings. For example, if you’ve assigned a specific ringtone for a contact, organized your contacts within specific groups or activated voice dialing for certain contacts, this information will not transfer over to your new device. You’ll need to manually set customized options for each individual contact on your new wireless device.